Review by Finn Madden aged 13. 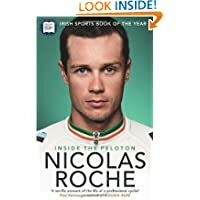 This book is about an Irish Cyclist, Nicholas Roche, son of the only Irish Tour De France winner, Stephen Roche, and his tale of how he got to be such a big name in cycling. At the start of the book, he tells of how his parents met and all about his Dad's success. He talks about growing up and how close he is to his sister, Christel. Nicholas didn't have the easiest childhood, changing from Irish to French schools, as his family were constantly on the move. He was mad into soccer and rugby but tore a ligament in 1998 which ended those sports, but started his cycling career. He joined professional team Cofidis in 2005 after some good performances in amateur races and from there on, his career took off, peaking in 2010 when he came 5th in La Vuelta. The book has diary entries from Nicholas for The Irish Independent which make it very entertaining and at the end of the book, he has included quotes from Stephen Roche a small piece from 2012 Tour De France winner, Bradley Wiggins. I liked reading this book as Nicholas wasn't neither cocky or modest. He described his emotions and his pain very well. I would recommend this book to any cycling fans of all ages ! This book is published by Transworld Ireland and is widely available. Great job on the review! My husband and I love to watch cycling and especially the Tour de France every year. Maybe I'll get this book for my husband.